Muslim Education Action Center, Amir Malik and lbrahim Kasaan. broadcast licenses must be revoked. The Corporation for Public Broadcasting has received $4 billion in taxpayer assistance for National Public Radio over the past decade. The people of the United States need to file a class action suit against NPR and get their money back. With the release of a video (above) by the same conservative gadfly who caught ACORN in the lens of his candid camera, calling Tea Party activists "..seriously racist, racist people..." And these are the people that Hillary Clinton said just a couple of weeks ago that they did a better job of reporting than Fox News, adding that's why Congress needs to increase the money it gives to NPR. 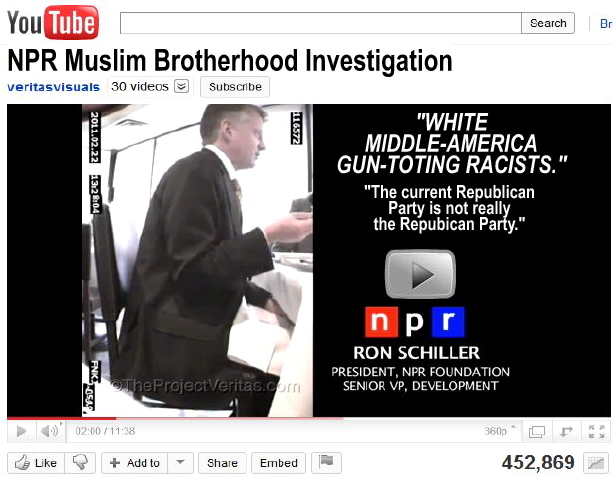 I wonder if that was to start up the Al Jazeera division of NPR called Sharia Public Radio? In the video, NPR Senior Vice President Ron Schiller makes it a point to say his organization receives a taxpayer subsidy of $90 million per year. In point of fact the Corporation for Public Broadcasting receives a taxpayer subsidy of $460 million per year that funds NPR, PBS and the social progressive broadcasting entity known as public broadcasting. Pitching two undercover reporters who were posing as members of the fictitious Muslim Education Action Center (which they claimed was funded by the Muslim Brotherhood), Ron Schiller played to the choir, telling them "...I think what we all believe is if we don't have Muslim voices in our schools, on the air...it's the same thing we faced as a nation when didn't have female voices," and laughing when one of the two mock-Muslims joked, referring to NPR as National Palestinian Radio. On their fake website, MEAC's mission statement "We are a charitable organization dedicated to promoting a proper understanding of Islam. It is our goal to ensure that every Muslim boy and girl grows up in a world safe from intolerance and fear. Islam requires that every Muslim observe and live under Divine Law, yet many cultures are not receptive to this life. Many Muslims are prohibited from governing themselves under the principles of their own faith. We must combat intolerance to spread acceptance of Shaira law across the world." This was the template that framed the views of NPR Senior VP of Development Schiller and Betsy Liley, NPR's senior director for Institutional Giving as they lunched with two undercover sting reporters posing as Amir Malik and Ibrahim Kasaam, who arrived at lunch with $5 million in loose change jingling in their pockets. Kasaam (fake name) told Schiller they wanted to fund public media to help defeat the "...the defunding process that the Republicans are trying to engage in..."
His mind salivating for the $5 million, Schiller had no problem selling his soul. He responded, "I think what we all believe is that if we don't have Muslim voices in our schools, on the airit's the same thing we faced as a nation when we didn't have female voices. The current Republican Party, particularly the Tea Party, is fanatically involved in people's personal lives and very fundamental ChristianI wouldn't even call it Christian...it's this weird evangelical kind of move. The current Republican Party is not really the Republican Party. It's been hijacked by this groupthat is..."
Schiller was interrupted by the man playing Malik, who finished his statement: "...the radical, racist Islamophobic tea party people?" Schiller completed Malik's statement by adding: "Not just Islamophobic but really xenophobic, I mean basically they are, they believe in sort of white, middle-America gun-totingI mean, it's scary. They are seriously racist, racist people. We've seen like certainly how the Muslim Brotherhood, for example, has been portrayed." Kasaam agreed: "I'm glad that NPR will give voice to people. And PBS as well. I'm glad they put Rashid Khalidi on to give the point of view, and will give the Hamas and Hezbollah view in addition to the Israel view." Fueled, Schiller decided to let his hair down, adding he would talk personallytaking off his NPR hat. "It makes me feel as though there is a real anti-intellectual move on...a significant part of the Republican Party. 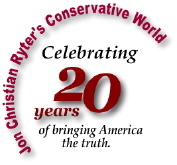 In my personal opinion, liberals today might be more educated, and fair and balanced than conservatives." Keep in mind that taxpayer dollars come from conservatives as well as liberals to finance public broadcasting. But NPR and PBS have, from their inception, been used by one Administration after another to sell their socialst agendas, and by the left to demonize the patriotic ideals of traditionally conservative America. In other words, the left's Fairness Doctrine is one in which the right has no voice. Fairness, in the public arena, is found where both the right and left vie on equal footing for the available audience pool, based not on arbitrary, mandatory measured audience shares, but rather on which message the audience wishes to hear. When the audience controls the "kill switch," fairness has been achieved. If the American people don't want the message of the left, fairness is not achieved by forcing them to listen. A mind-control dictatorship is. In the mind of the left, when that happens, "speech neutrality" will have been achieved. *NOTE: While there were 9 Crusades launched by Christian monarchs against the Muslims from 1095 AD to 1302 AD, there were actually 21 wars fought which bore the title of "Crusade," with the last being what history recalls either as the Boehemian Wars or the Hussite Wars. Only two of the Crusades which happened between the 10th and 21st Crusades were wars fought with the Muslimsthe 17th and 18th Crusades. The 17th Crusade occurred in October, 1365. Peter I of Cyprus, leading a fleet of 165 ships, attacked and looted Muslim Alexandria, Egypt. Peter never attempted to set up a government in Alexandria since it was too far from Cyprus to defend or rule. The 18th Crusade took place in the summer of 1390 when French-Genoese privateers, led by Louis II, Duke of Bourbon, attacked the Barbary Coast pirates with an armada of 60 ships, 5,000 knights and soldiers and 1,000 sailors. The Muslims brought a force of about 40 thousand men against them. Even greatly outnumbering the Christian crusaders, the Muslims could not defeat them. After losing about 20% of their force, the Crusaders agreed to sign a treaty with the Barbary Coast pirates.Theologically, we will experience one 21st century crusade when jihad explodes in the Mideast and around the world; and Christianity, Judaism and Islam appear to find common ground where they can walk together in peace. The world leader who settles that all-consuming jihad will be hailed as a true man of peace. He will be installed as head of the world's government. The world knows this man as the most direct descendant of Mohammad. The Bible already knows him as Antichrist.